A good logo is a major contributor to making that crucial first impression on a customer. Logos convey your company’s values, tell a story, and even help people trust your brand. If your logo does not convey the right message to a prospective customer, your company is at an immediate disadvantage. It could even mean the difference between selecting the competition over you. A logo is an icon, whether it’s made up of text alone, a graphic symbol, or both of those elements. And that icon should be visually balanced in order to create maximum impact on your viewer. Favor logos that have a strong, balanced look. Simplicity is vital. A complex logo will be difficult to print and reproduce. Even worse, complex logos can be harder for casual viewers to quickly recognize and identify. Your logo does not always need to literally describe what your business does. Have you ever seen a car manufacturer with a picture of a car as their logo? How about a shoe manufacturer? It would look silly to have a picture of a shoe… on a shoe. Besides, such literal interpretations are not going to be memorable for a viewer. When considering logo designs, choose a logo that communicates the essence of your brand without even needing the company name. (examples: Swoosh for Nike). For this to succeed, the logo must be unique and it must be informed by a deep understanding of your brand. It also helps to walk the line between designs that are obvious and abstract. Logos that are too obvious are most likely already used by many other companies - and as such, will not be memorable. But too much abstraction can be dangerous because your message can be lost. So, aim for a logo that cleverly uses visual elements to embody your business's brand. Viewers are more likely to remember your logo if it's unique and it made them think (just not too hard). A logo should be visible and easily identifiable on a big billboard from 100 meters away or on a small business card from to 20 millimeters away. So make sure your logo can scale in size. Consider how your logo will be used. If your logo will regularly appear embroidered on uniform shirts, aim for a relatively simple design that won't lose it's impact in that medium. If it will only appear in print or online, you can get away with a slightly more complex design due to the sharpness print and online use provides. Make sure your new logo design works well in full color, as well as in black and white. This will ensure that it shows up well on any background - light, dark, or multicolored. It's vital that you be able to use your logo consistently on all marketing materials. So make sure your logo is flexible enough to accommodate all marketing materials. You can learn more about flexible logos in our guide on the subject. When choosing colors for your logo, bear in mind two important factors - brand appropriateness and cost. Different colors communicate different emotional ideas. Make sure that your logo colors convey appropriate messages about your brand. Do the colors reinforce and strengthen your brand identity? (For example, blue often communicates trust, loyalty and freshness. The color blue is common in banking and finance. Green commonly represents life, nature and purity.) If not, then you should consider a different color choice. When printing a logo, costs increase the more colors are involved. So, think twice about including more than 3 colors in your logo – or ask your designer for a version featuring fewer colors as well as black and white versions. You can use your most colorful variation of the logo on the web and save the restricted color version for print use. But, remember that consistency is key. It's best if you can use the same logo on all media. Although gradients provide an aesthetically-pleasing effect on computers, they are harder to reproduce effectively offline. For a primrily web-based business, gradients are a-okay. But, if you plan to use your logo on many physical mediums a color gradient logo may not be the best option for you. A logo should have a long life expectancy. It may evolve and change over time, but those changes should be minimal at best. A consistent brand identity helps to build strong customer relationships. For this reason, the best logos change very little yet feel fresh and vibrant every time you see them. So how do you ensure that your logo will serve your business well for a long time? Avoid trendy logo design fads. They're likely to anchor your logo in a specific time period and feel outdated quickly. Instead, make choices that are informed by your brand identity which should remain consistent even as your business grows. A good logo stands out from the crowd. In order to do this, it must be unique. This is yet another reason to avoid design fads or overused concepts like these. With thousands upon thousands of fonts, billions of color combinations, and an infinite flow of possible design ideas, there's no excuse to choose a common logo. 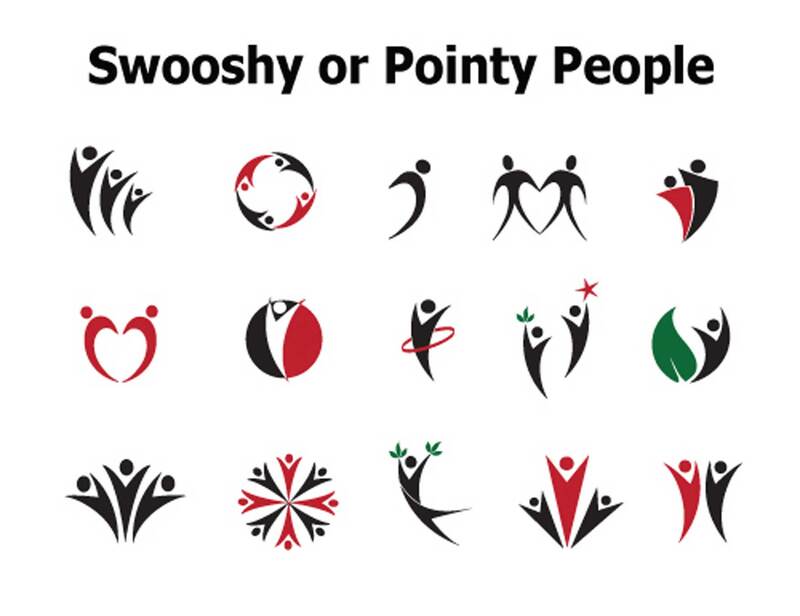 Try to avoid common logo cliches like “swooshy people,” “wooshes,” and “pinwheels." Also familiarize yourself with the logo cliches in your industry - and then carefully avoid them. A boilerplate logo is the quickest way to look low-budget and worth ignoring. Don't forget the font! The typography you choose for your logo must communicate on two levels - it should be easily legible and it must visually reflect your brand identity. Avoid any fonts that are too difficult to read. Can it be read at small sizes? Is the letterspacing/word spacing well adjusted? From the options remaining, prioritize the fonts that visually represent your brand. Ask yourself what you’re trying to communicate. Is your brand playful or dignified? Modern or old-fashioned? Serif typefaces (as pictured above) convey a sense of dignity, old-world reliability, and elegance. They're also easier to read in print. Sans serif fonts are often more clean looking and easier to read on a screen. They can be very versatile - communicating stability, power, or whimsy depending on the execution. Your logo has to derive meaning from your brand, not the other way around. The world’s best brands are not well-known because of their logo, they are known because of the people and vision that the logo represents. When deciding on the direction of your logo, make sure that you have already thought about your brand and the direction of your company. Keep your audience and products/services in mind as you plan your logo. This guide on building your brand identity from the ground up is a good start. Always request vector-based graphics. It’s often tempting to ask for complex illustrations in a logo. However, unless you plan on never using your logo outside of an on-screen/online application, a JPG or PSD isn’t going to cut it. A properly drawn vector design will provide you with the ultimate flexibility. Good branding provides a unique opportunity for small businesses to stand out from the competition. With the right logo, you are communicating your brand’s values from the first moment a customer sees it. You only get one chance for a first impression, so make it a good one.